Last November, when roadside produce stands were closing down shop for the winter, I snagged a ten-pound bag of young beets for ninety-nine cents. 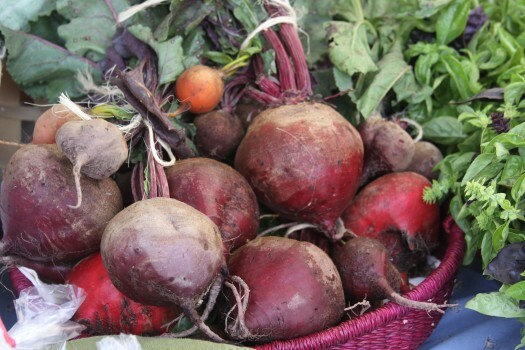 Thrilled at the great deal I had just made, I imagined the beets lasting us through the winter – and all for pennies. They were gone by Christmas. Apparently I like beets, a lot. There’s something about their firm texture and earthy I-can-taste-the-garden flavor that satisfies my hankering for vegetables in January. 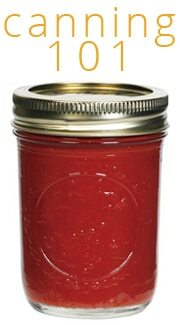 I’ve since discovered that my ardor for this hearty, affordable, vegetable is shared by few; too few, in my opinion. Perhaps cooks are deterred by the length of cooking time, as beets must be first roasted or boiled properly, but then again, so do potatoes. I believe, as is often the case with lesser-known ingredients, that people just don’t know what to do with beets. Hopefully by the end of this post, I’ll have planted a few ideas for incorporating the mildly sweet, crimson-red beet into your cooking repertoire. The first thing you’ll notice about beets is that they are as hard as golf balls – or at least they should be. Don’t buy beets that are soft or wrinkly around the tops; they should have the potential to bust a window, but who needs that information? Scrub the beets well under cold water, but do not peel them – yet. Beets are best cooked with their skins on to retain flavor and moisture. Plus, the skins slip off easily after they are cooked. You can boil or roast your beets, with roasting yielding a slightly sweeter end result simply because the natural sugars caramelize during roasting. In my tutorial on roasting vegetables, I share a basic recipe for roasting beets that can be used for all sizes and varieties. Boiling beets is even simpler. Cover whole beets with cold water and bring to a boil. Partially cover pot, and simmer over medium heat until the tip of a knife slips easily into the beet. Cooking time will vary with freshness and size of beets. Once the beets are boiled or roasted, it’s time to peel them. I do this in my kitchen sink (and avoid stained cutting boards or counters) under running cold water. Trim the ends of each beet and use your thumbs to rub the skin off. This is best done when they are hot or still warm. 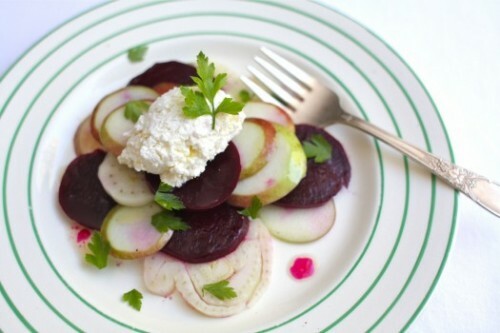 The ever-resourceful website The Kitchn shares five ways to eat beets but I’ve rounded up five times that for your perusal. 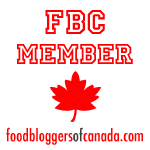 Bookmark or Pin this post, then go buy a bundle of beets! Below I’m posting my third recipe on this blog for a salad featuring beets, which demonstrates just how suitable I find them for a fresh-tasting winter salad. There are a host of ways beets can enhance a salad; here are just a few. Now, the Ukrainian in me will bitterly defend the position that a classic borscht is the best beet soup on the planet, especially if it is made by Baba. However, I realize that beets lend themselves beautifully to many varieties of soups. I can’t wait to try the recipes below. Simple roasted beets with a drizzle of olive oil and a sprinkling of salt is a fine side dish, if you ask me; however, if you care to dress them up even further, try one of these recipes. Dessert? Yes please. 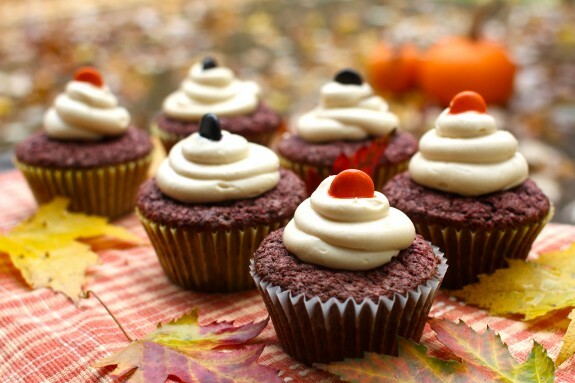 Beets lend sweetness and moisture to a variety of baked goods. Here’s a few ideas from the experts to get you started. A quick scroll through the ‘beets’ tag on Punk Domestics was all it took to convince me that home canned pickled beets need to be added to my winter canning repertoire. The only question remaining is: which recipe first? This pretty winter salad makes for the perfect lunch. 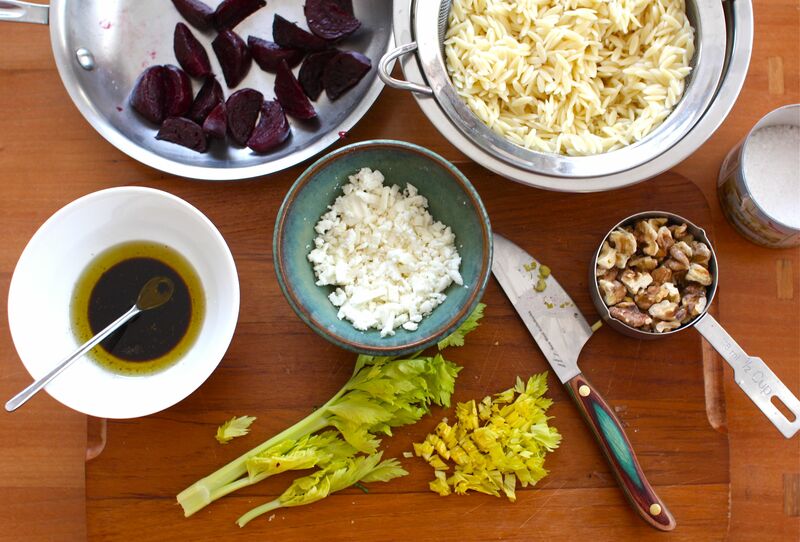 A simple balsamic vinaigrette brings together the sweetness of the beets and the mild orzo pasta. Creamy feta cheese provides both saltiness and acidity, while celery leaves balances the salad out with their slightly bitter taste. A number of winter greens would be great in this salad; try arugula, chopped Belgian endive or shredded radicchio. Recipe: Beet & Orzo Salad with Feta, Walnuts & Celery Greens. Sweet, salty, earthy and bitter flavors combine to make this vibrant winter salad. Bring a pot of salted water to a boil and cook orzo as per package directions, about ten minutes. Rinse with cold water and set aside to drain well. In a small bowl, whisk together olive oil and Balsamic vinegar. In a large bowl, combine orzo pasta, vinaigrette and sliced beets and mix well. Add crumbled feta and toasted walnuts; toss to combine. Roughly chop celery leaves or other bitter greens and add to the salad, mixing well. Lightly season the salad with salt and pepper, then taste and adjust as necessary. Be sure to add salt only after the feta has been added. Some varieties of feta are far saltier than others, and additional salt may not be required. How are you enjoying beets this winter? Cooking has always been Aimée's preferred recreational activity, creative outlet, and source of relaxation. After nearly ten years in the professional cooking industry, she went from restaurant to RSS by trading her tongs and clogs for cookie cutters and a laptop, serving as editor here at Simple Bites. 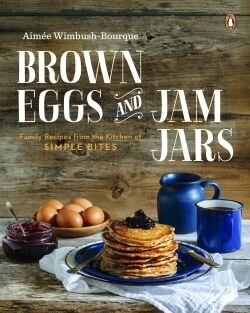 Her first book, Brown Eggs and Jam Jars - Family Recipes from the Kitchen of Simple Bites, was published in February 2015. Get more delivered to your email inbox. Prefer to subscribe via RSS? I grew up thinking that I didn’t like beets. But now I am learning that I absolutely love them – and I can’t get enough of them! Me too! It’s crazy how we grow up with one impression and then realize how wrong we were. For me, it’s usually because I only had that vegetable served one plain, drab way. But if I use a different recipe it tastes worlds better. Roasting is my favorite cooking method. Somehow I don’t think our grandmothers were stirring beets into brownies. They’ve come a long way and deserve some time in the spotlight! 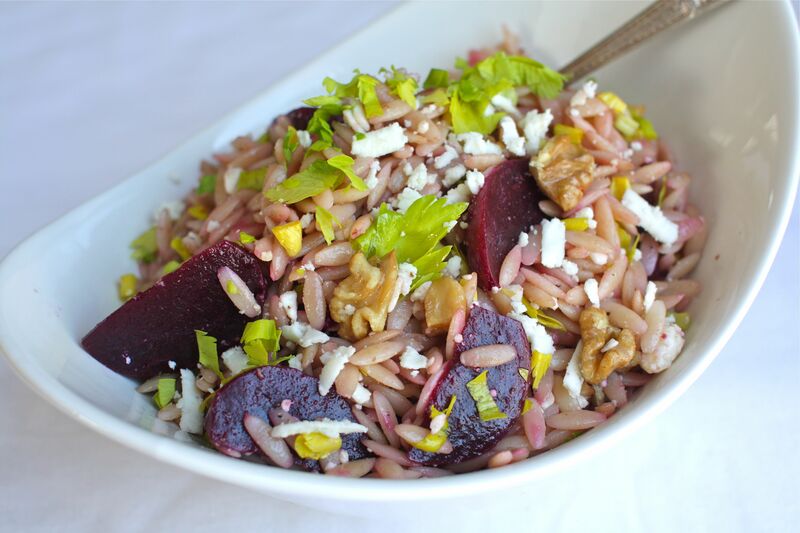 The beet and orzo salad looks amazing! We love beets here. Simply roasting them with some olive oil and salt in the oven is how we eat them mostly…or I steam mine and then put butter and vinegar on them, yum 🙂 I agree that they are great in winter salads! Grating them in with some carrots gives me a wonderful burst of color. It is nice to eat pretty things! For many of us, I think it is “They aren’t your mother’s beets” (or grandmothers) that we need to focus on. I truly believed that putting up beets in a rather strong vinegar and eaten cold was the only way they could be used. While I generally love heritage recipes and old receipes, cold, from the frodge cold, beets just didn’t do it. I am gradually getting over that, but childhood memories, particularly of food, are hard to pass by! Will have to try that salad! You’ve listed some great sounding recipes. It just goes to show how versatile beets can be. These days, you can get some interesting varieties and colours (golden or red and white stripes) too. I’ve heard that to remove beet stains, Julia Child recommended rubbing the stained areas with salt, rinsing, and then scrubbing with soap. Personally, I don’t like scrubbing so I also peel beets in the sink. Good tip about the salt. Thanks for sharing! I have to admit, the only beets I’ve had were pickled. I’ve never had them fresh before. Time to change this and try a “new” food. You’re in for a pleasant surprise, Kara! Glad you are up for something new. I’ve always thought I don’t like beets but I actually can’t remember the last time I tried them. I’ll have to make a recipe and give them another chance. I have every ingredient that is needed for this salad, and now I know what’s for lunch today. Thanks for sharing!! I love beets!! My poor readers must be so sick of my beet exploits by now… Between roasting them (my favorite) and boiling them for salads (which I have been doing ALL THE TIME lately), I can’t get enough! I realize we already discussed this, but roasted golden beets, goat cheese, arugula,a bit of lemon vinaigrette. It doesn’t get much better than that. Agree. There’s something about golden bets…Do you grow your own? I want to this summer. 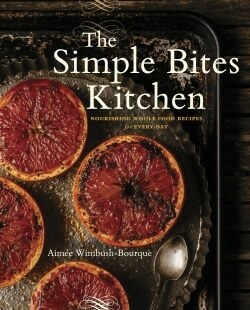 I love beets and am excited to have all these wonderful new ideas of how to use them. I usually narrow my cooking selections down to salads only. Ironically, I was just reading the other day that beets were one of the healthiest vegetables we’re not eating! 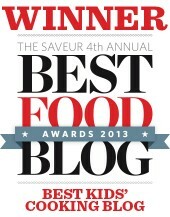 My kids love a recipe from Food & Wine – Beet and Cheddar Risotto. 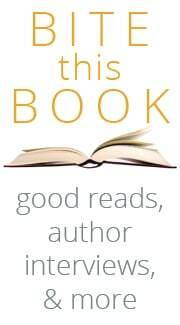 (You can find it online.) This recipe makes a great weeknight meal, and the leftovers freeze well also. We mostly eat beets raw. I like them roasted and cooked a few other ways but our kids won’t eat them and due to various time contraints when cooking dinner I usually don’t have the time to deal with cooking them. But when I shred them with the Salad Shooter (yes, I really am that big a dork) and add them to salads our kids wolf them down. A salad of winter greens with shredded beets and carrots, golden raisins, walnuts, with a honey mustard dressing is a staple this time of year. If I’m with it I’ll add chunks of roasted squash to make it a main dish but it’s been a crappy squash year so I haven’t done that in awhile. That raw salad sounds amazing, Beth! Thanks for sharing. I LOVE beets but often have a problem with them staining my hands. Now I use gloves (the non-latex kind are very cheap by the box at your local drugstore). Makes it easier to peel before or after cooking. I need to go find some beets. I’m sure they won’t be as good as the ones I had out of my garden, but I’ll eat them anyway. I had pretty good luck cooking them in my pressure cooker too… and fresh beet greens.. yum! I can’t wait for garden season. I love the simplicity! 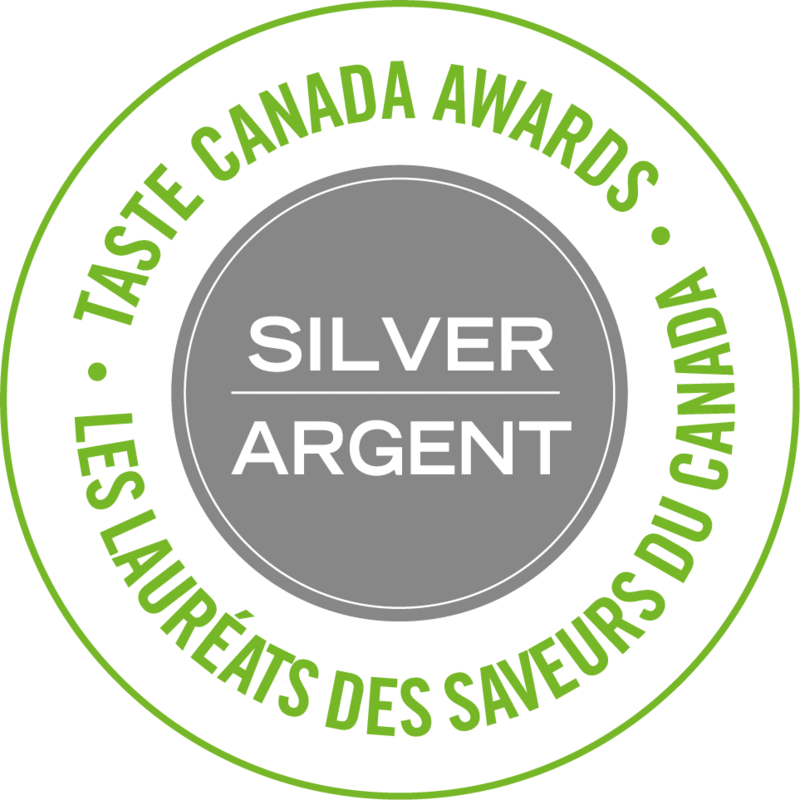 Just great ingredients and fantastic flavour. Brings me back to my childhood! I have to admit, I’m a recovering beet-hater. I always wanted to like them, but never could until I watched my (3-yr old) son eat an entire beet salad by himself. If he likes them, then I obviously haven’t given them enough of a try! Been enjoying them lately roasted in a salad with goat cheese but am going to have to try a few new recipes now! I love this posting, thank you. I hate recipes when they use red food coloring. I much prefer using beets in those recipes. I have a Red Velvet Ice Cream recipe that I love, tastes like chocolate ice cream with a zing and is very red from the beets. Love love love beets! Just made a big pot of borscht, but also love them in salads, grated into muffins and cakes, pickled.. roasted straight up or in soup with a sweet potato.. you name it! Dan won’t touch ’em, but beet-pickled eggs are one of my favorite nostalgic foods. We ate them by the dozen growing up! I absolutely LOVE beets. So many great recipes here! They are not really very nice when thawed, Colleen. I freeze puree for baking and that is about it. Thanks, Aimee. That helps make my decision a little easier. Pickled beets it is! It’s okay, I do love pickled beets! Simple Bites is built on the Genesis Framework.